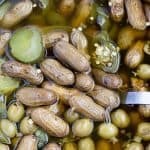 These peanuts have an interesting dill flavor that combines perfectly with cajun spice. Thoroughly wash raw peanuts under running water. Add peanuts to an empty pot. Add jalapeños, pickles, pickle juice, olives (with juice), and crab boil seasoning packet to pot. DO NOT STIR. Add salt, cayenne, and water. Again, DO NOT STIR. We want all the peanuts to remain submerged. And if you stir them, they will all float to the top. Lock lid and cook at high pressure for 120 minutes. Once cook time is complete, allow pressure to release naturally. Then let the peanuts sit for as long as you can stand it! Before you stir them, carefully remove the crab boil seasoning packet. They rip pretty easily. I’ve made these several times and recommend cooking them at night and letting them sit overnight on the "keep warm" setting. If you use a full teaspoon of cayenne, the peanuts will be very spicy. Reduce amount of pepper if you prefer less spicy food.